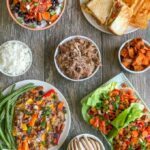 Here’s a week of component food prep from a Registered Dietitian and how to use it to make quick, healthy meals during the week! 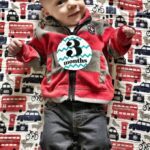 I’ve been meaning to write a post like this for a while now and I finally got my act together. You guys know I love food prep. 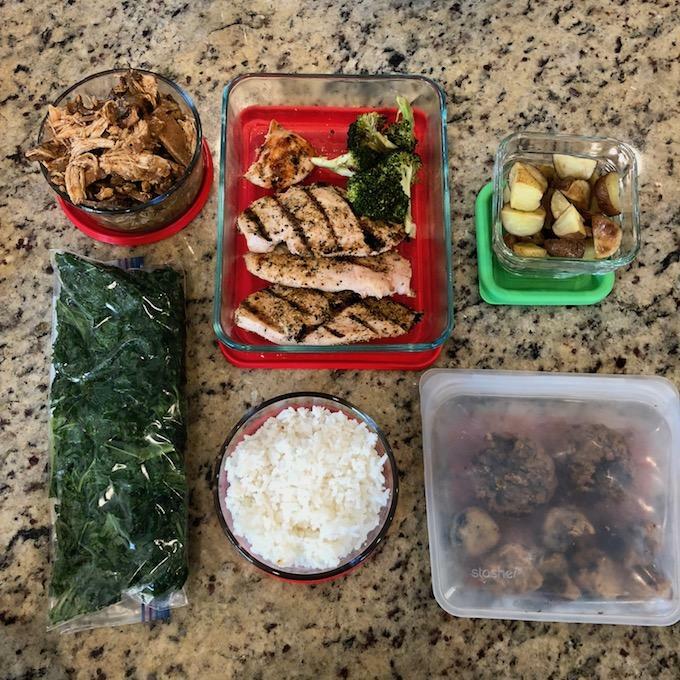 You may also know that I don’t typically prep full meals…instead, I prep components and then throw them together, as well as cook some new things, to make meals during the week. 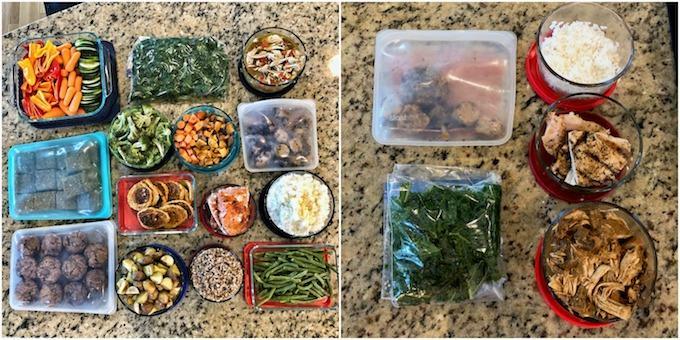 Last week I documented what I prepped and then all of our meals so I could show you how I use what I prep throughout the week. If you’re not already, be sure to follow me on Instagram, where I share my food prep sessions on Sundays, plus meals during the week. 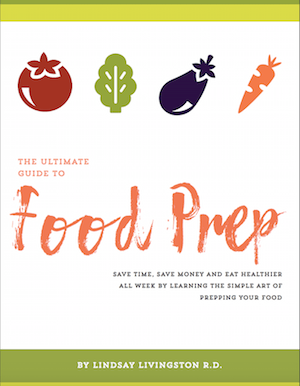 One of my favorite food prep tips is to think about what you can do ahead of time what takes minimal effort. 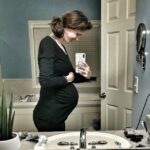 On Saturday evening I had about an hour before we were headed to a dinner party. I turned on the oven, dumped a bag of baby carrots on one pan and put 5 sweet potatoes on another pan and stuck them both in the oven at 400 degrees. Literally took 1 minute of effort and by the time we were ready to leave, they were both done and in the fridge, ready for me to use in the morning. I also pulled one of my freezer crockpot dump meals out of the freezer and stuck it in the fridge. So, when I woke up Sunday morning, I turned on the oven first thing and dumped the crockpot meal into the crockpot. 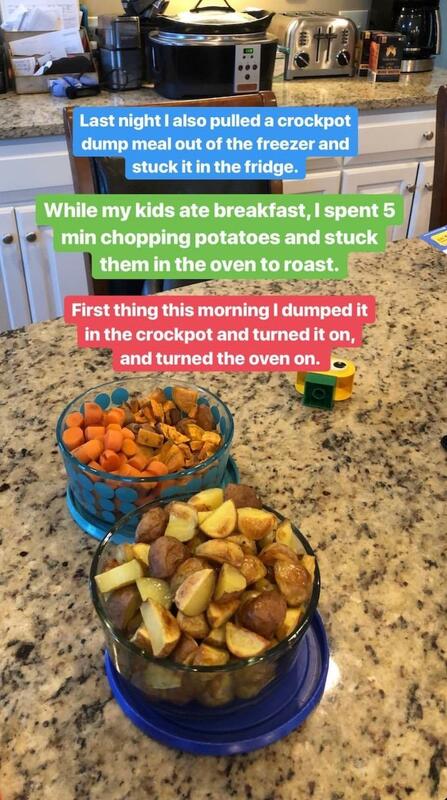 While my kids were eating breakfast, I spent 5 minutes chopping the sweet potatoes and regular potatoes and stuck them in the oven to roast. While those veggies were roasting, I got out the carrots I’d roasted the night before and whipped up a batch of Carrot Oat Bars. 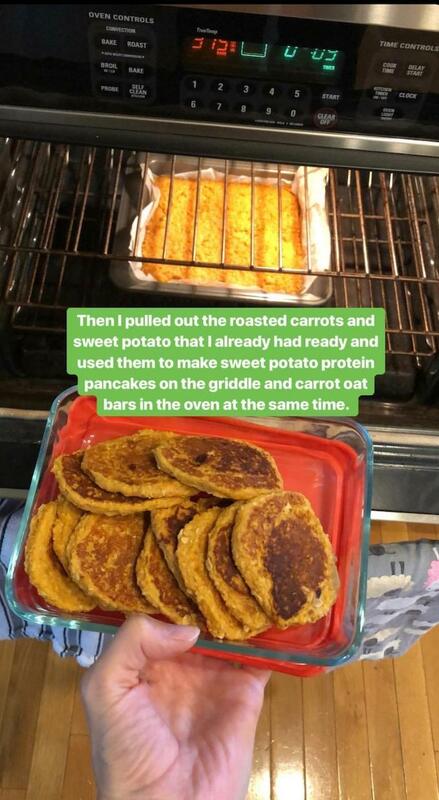 As soon as the veggies were done, I stuck the carrot bars in the oven, rinsed the food processor and used one of the sweet potatoes I’d cooked the night before to make the batter for my Sweet Potato Cottage Cheese Pancakes. I cooked those on the griddle while the bars were in the oven. I had about 5 minutes left before the bars were done so I chopped up a head of broccoli and snipped the ends off green beans to get them ready to go in the oven. 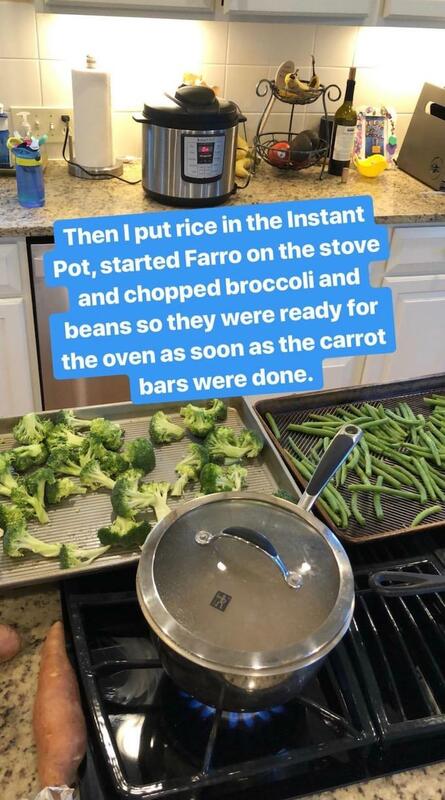 I also dumped some rice in the Instant Pot (I do 1 cup white rice to 1.5 cups water for 7 minutes, quick release) and started some farro on the stove. I put the farro and water in a pot, cover, bring to a boil, crack the lid, reduce heat and simmer for 12 minutes, then drain the water. 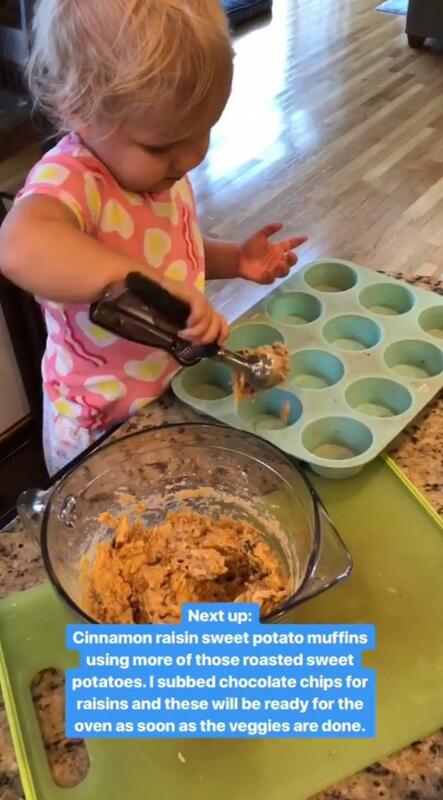 After I took the bars out and put the veggies in (I spray with avocado oil, and roast at 400 for 12-15 minutes), Little Miss and I made some Cinnamon Raisin Sweet Potato Muffins. I subbed chocolate chips for raisins. We had them ready to go into the oven as soon as the veggies were done. While the muffins were baking, I did some dishes, started transferring stuff to my Pyrex containers. 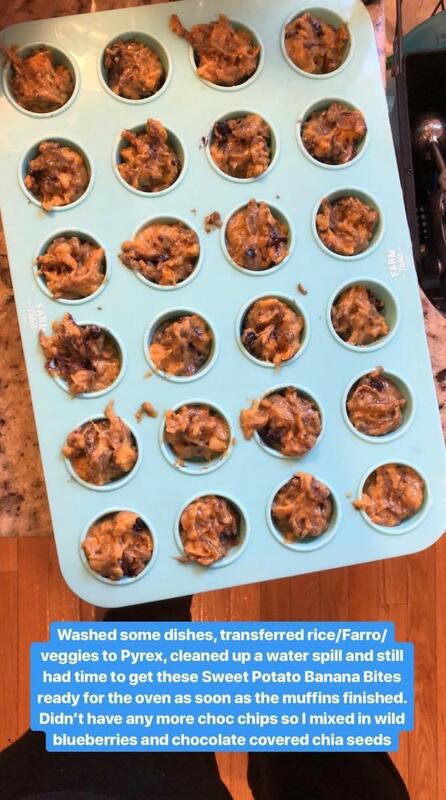 I can’t find my exact set but this is a similar set of Pyrex containers (aff link) and made a batch of my Sweet Potato Banana Bites. We were out of chocolate chips so I added frozen wild blueberries and chocolate covered chia seeds from Salba Chia. 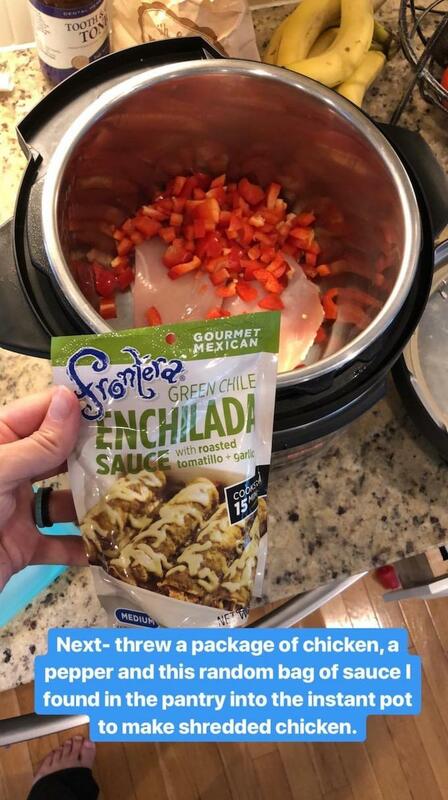 Once I put the sweet potato bites in, I threw some chicken into the Instant Pot with a package of Frontera enchilada sauce that my mom bought sometime while visiting. The chicken breasts were thick so I cooked them for 16 minutes and then shredded. 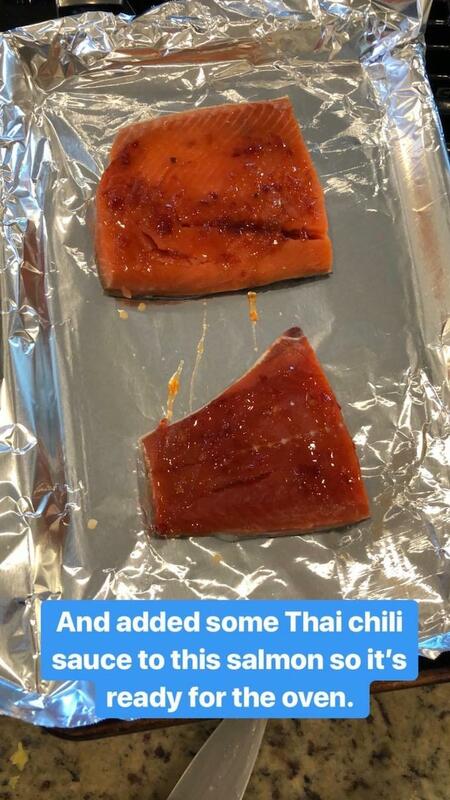 I also put some salmon on a pan, added a little sweet thai chili sauce and had it ready to go in the oven when the sweet potato bites were done. The last thing I did was chop some veggies for snacking and prep the kale. I remove the stems, chop it up, wash it and spin it dry, then put it in a ziploc, drizzle a little avocado oil on it and massage it until it starts to soften. Once everything was done, here’s what it looked like. Plus the bbq chicken and mushrooms that was still in the crockpot. 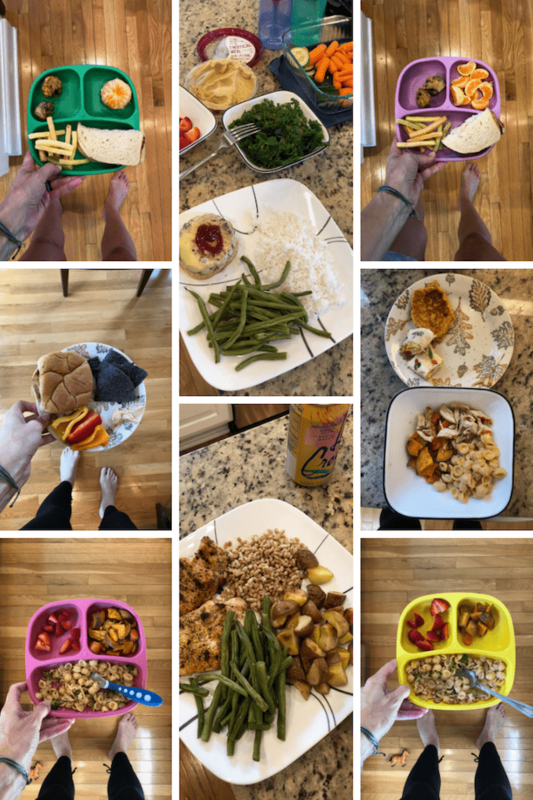 (Recipe will be in my freezer ebook) Since most of these are components, I wanted to show you guys how we used the food I prepped throughout the week to make quick meals. The baked goods are often eaten for breakfast and snacks. Both my kids eat Dole peaches in 100% juice and yogurt almost every morning. Then we change things up with either a fried egg and toast, pb&J toast, oatmeal etc. My youngest usually eats a muffin. She also eats 2 carrot oat bars when she wakes up from her afternoon nap every single day. I usually eat a fried egg on toast with avocado and a muffin for breakfast every day. My husband doesn’t eat breakfast. 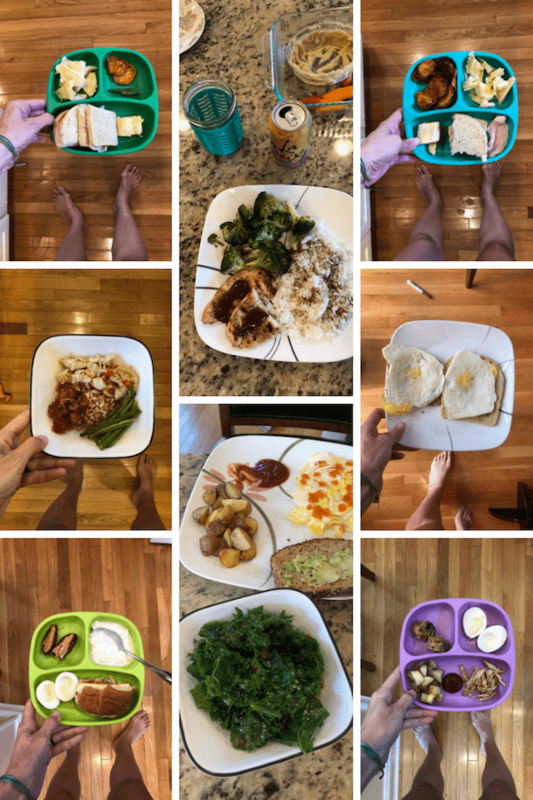 Everything in red in the meals below is from my food prep session. On Monday, for lunch, the kids at some of the shredded chicken, with cheese in a taco. They each had a clementine and Squish had sweet potato bites while Little Miss had a carrot bar. I made a bowl with farro, shredded chicken and roasted sweet potatoes. I topped it with avocado, salsa and chips. My husband had to run out to get lunch between work meetings. He usually comes home for lunch since his office is close to home. For dinner, I made a package of cheese ravioli from the freezer and the kids both ate that, plus a sweet potato cottage cheese pancake, banana with peanut butter and some leftover Braciole (stuffed flank steak) that we brought home from dinner at my in-laws on Saturday. 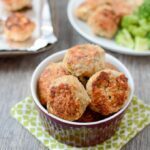 I have the recipe for Braciole on the blog. I made quick soup using some shredded chicken and roasted carrots, plus some Lotus Foods ramen and chicken broth but only ended up eating about half of it (thanks pregnancy). My husband had leftover braciole, some roasted broccoli, farro and snacking veggies, plus fruit. On Tuesday, for lunch the kids had naan pizza. I usually have mini naan bread in the freezer so I just pulled a couple pieces out, microwaved to thaw, topped with hummus, some shredded chicken and cheese. Squish had his with carrots and ranch and apple slices with peanut butter. Lyssie had hers with roasted sweet potatoes and strawberries. 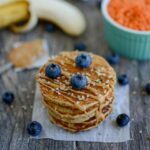 I had a couple sweet potato pancakes, plus a few omelet spirals that I made that morning to shoot for the blog. My husband had shredded bbq chicken and mushrooms, rice and broccoli plus fruit. For dinner, my hubby grilled a few burgers and a package of chicken we bought over the weekend. The kids each had half a cheeseburger, avocado toast and sweet potato bites for dinner (plus Little Miss had some roasted potatoes. I had another bowl with farro, shredded chicken, roasted sweet potatoes and roasted green beans topped with salsa, avocado and chips. My hubby had a burger, roasted potatoes and snacking veggies and strawberries. On Wednesday, we went to the bakery after swimming. For lunch the kids had pb&j on farmhouse white bread from the bakery (they typically eat Dave’s Killer Bread), veggie straws, clementines and sweet potato bites. I had some of the bbq chicken and mushrooms on a bun+ snacking veggies. Hubby had a burger, plus green beans, rice, kale and snacking veggies and some strawberries. For dinner, I made a box of mac and cheese. I added some of the roasted broccoli and leftover grilled chicken to it. Plus they had roasted sweet potatoes and strawberries. I had mac and cheese with some of the shredded chicken and roasted sweet potatoes plus a few sweet potato pancakes and leftover omelet spirals. Hubby had leftover grilled chicken, plus farro, roasted potatoes and green beans. On Thursday, for lunch turkey and hummus sandwiches, leftover ravioli, some sweet potato chips I’d tested for the blog that morning, a green bean and leftover omelet spiral. I had a bowl with farro, green beans and shredded chicken and hubby had leftover grilled chicken with bbq sauce plus rice and broccoli. For dinner, Squish had a date with pb, cottage cheese, hb egg and bbq chicken and mushrooms on a bun. 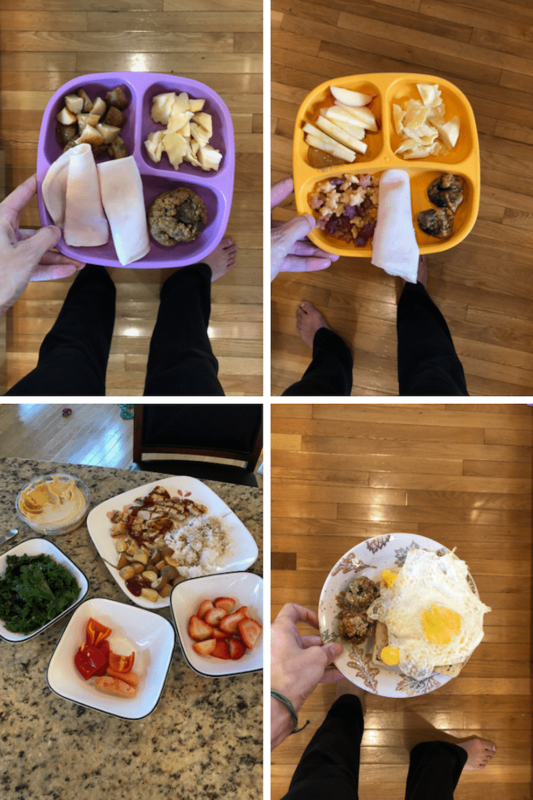 Little Miss had an egg, roasted potatoes, shredded chicken and sweet potato bites. I had two eggs on avocado toast and hubby had 3 eggs, avocado toast and some roasted potatoes and kale. some chicken (which wasn’t cooked until Tuesday and not part of my Sunday prep). On Friday for lunch, Little Miss had a muffin and roasted potatoes, plus turkey and leftover tortellini. 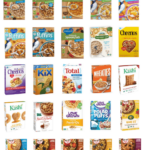 Squish had apples with pb, Love Grown sea stars cereal, tortellini, turkey and sweet potato bites. I had an egg on toast with pumpkin energy balls. Hubby had chicken, rice and potatoes, kale, hummus and veggies and strawberries. We obviously don’t mind repeating the same meals a few times during the week, but the beauty of component food prep is that you can do that, or put it together in different ways and flavor differently using sauces etc. No, our family does not all eat the exact same meal every night. I realize this isn’t the norm but it works for us. 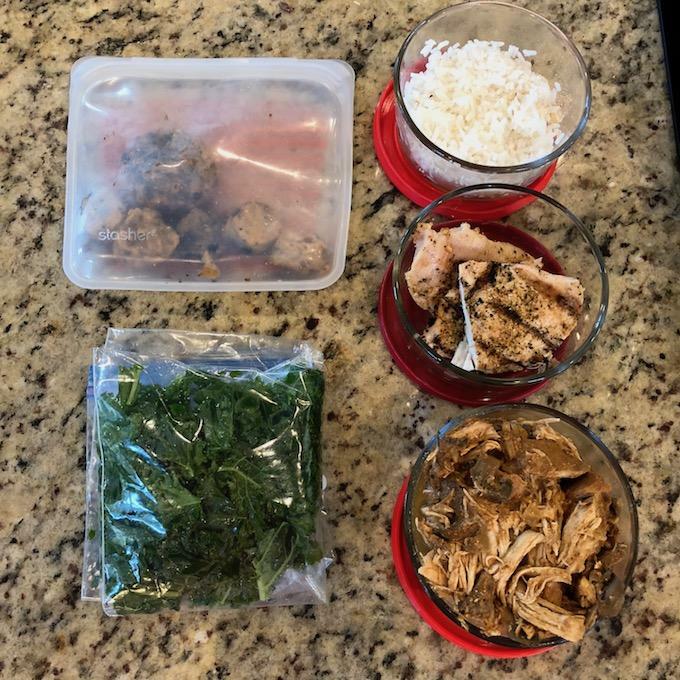 Because of the component food prep I do, it’s easy for me to quickly throw together different combinations as shown above in the same amount of time as it would take for me to make one dish for all of us to eat. No I don’t prep every single thing we eat all week. You can see that I cooked a few things during the week. 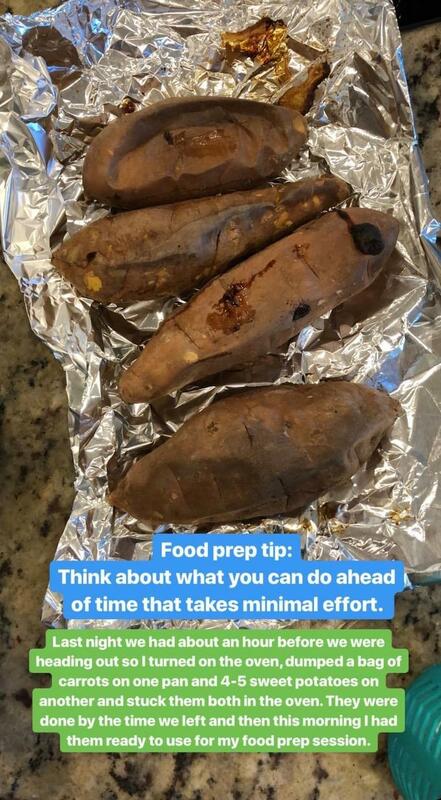 I use food prep to help me but don’t think you need to prep every morsel of food for the week in order for it to be successful. We do a pretty good job of not wasting food, but it does take a little practice to understand your family’s needs. 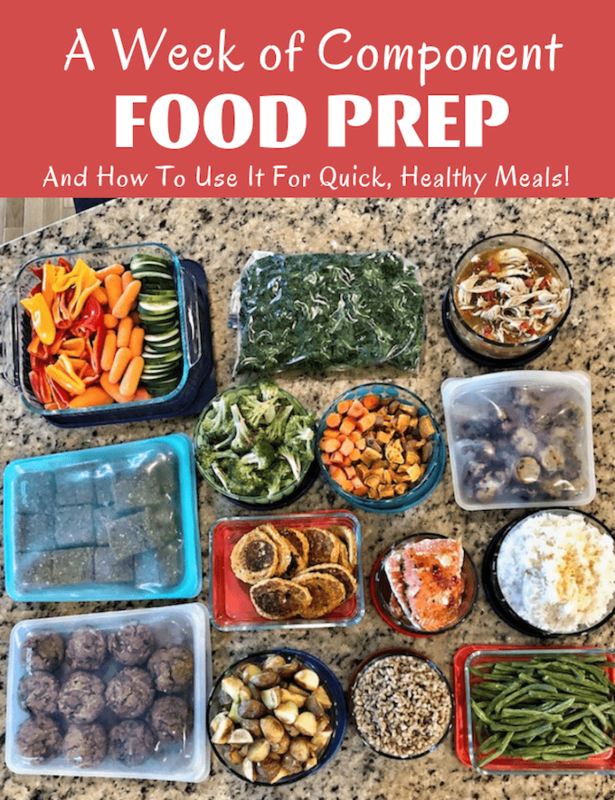 I always suggest under prepping as you learn what works for you and then slowly increase the amount you prep until you find what works best. Most weeks, the majority of the food I prep Sunday nights is gone by Thursday. 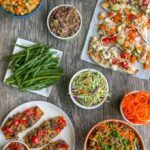 Most leftovers are good in the fridge for 3-4 days. We typically stretch it to 5 days but it’s certainly up to you and your food safety comfort level when it comes to food prep. If you like to err on the safer side, you can prep enough to get you through Wednesday as well as a freezer meal that you could thaw overnight and cook to eat on Thursday. It’s all about finding what works for you and your family! 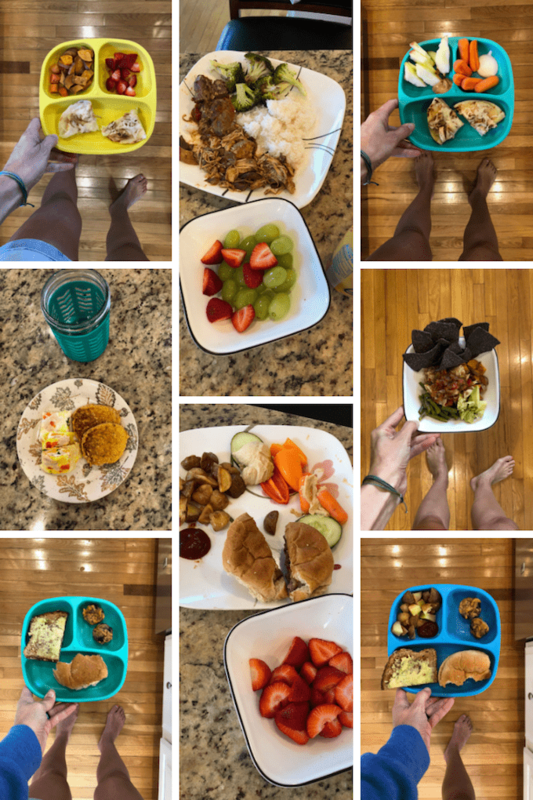 If you want to see how much of the meals my kids actually eat, be sure to follow me on Instagram. 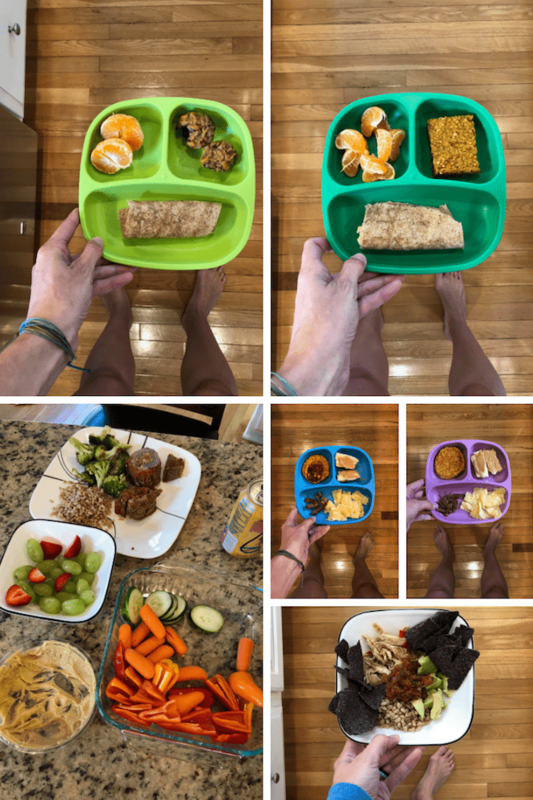 I share before and afters of their plates for most lunches and dinners. This might be a dumb question, but how do you eat the massaged kale? 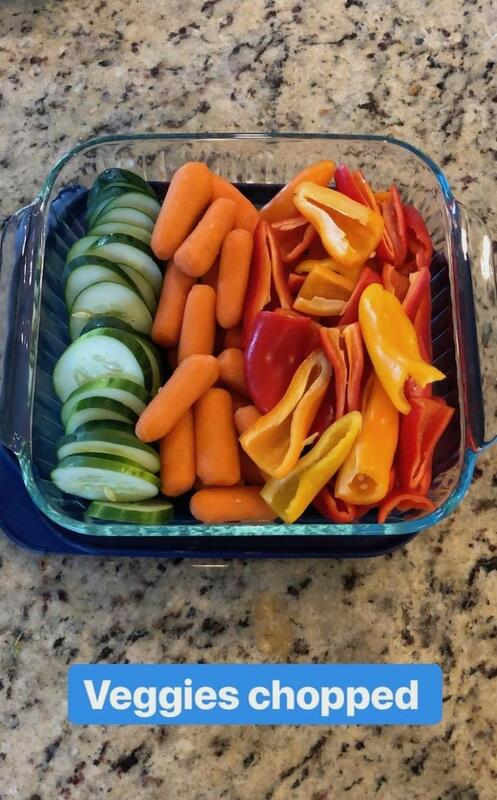 From the pics I assume it is like a salad, but do you throw some seasoning on it or top with dressing or something? How is the texture of it massaged vs straight from the package? my husband just adds salad dressing and eats it as a salad. It’s better than just raw straight from the package. How do you prep the BBQ mushroom chicken? This is impressive prep! recipe is coming in my freezer ebook! 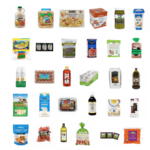 My daughter is vegan and the rest of the household is omnivore. 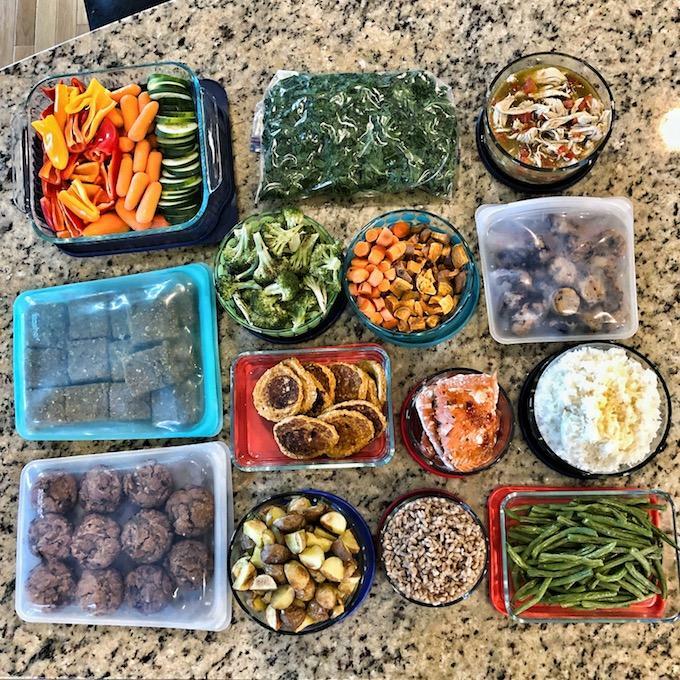 Component food prep saves my sanity – a grain, a couple of protein sources (vegan and non), and lots of veggies, and we can all eat. 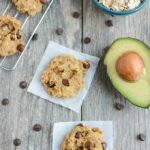 I’ll have to find a vegan version of your bars for breakfasts/snacks. Where did you buy your silicone bags?! Your meal prep is always so inspiring! I’m going to start doing more of it!